This is a clone of the post in the original thread. We might want to put build questions in this thread. Added Mouser Project Manager bill of materials for the Precision MS Matrix. These lists are not editable but you can "order" the project to move it to your shopping cart, then save the cart as a project to allow editing. There are two lists one with, and one without, THAT ICs. I chose an LME49860 for the 5532 location. There are no bridge rectfiers on the BOM for phantom protection: Most people don't use them. +/-15V to +/-18V at ~ 40 mA. I recommend 18V rails as it buys you slightly more headroom in the Encoder Mid channel. The flow diagram. Note that points B, C, F and G correspond to the header connections. 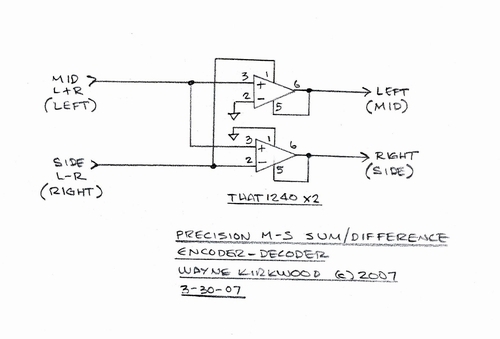 Note that the Encoder and Decoder are interchangeable. For highest accuracy I recommend that the left side be used as the Encoder and the silkscreen is marked that way. For -6dB encoding, the decoder side can be used but it's far less accurate since the 1% MF resistors of the -6dB stage are in the Mid/Side Domain where they affect crosstalk. When the -6dB stage is used in the decoder, the accuracy of the resistors are far less critical since the only affect channel balance by a very small amount. A photo might help too. Note that D1 is installed backwards in the photo. 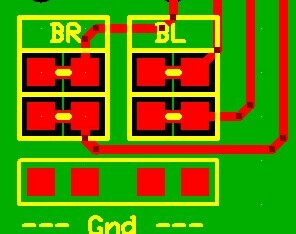 Both really point to the right and the PCB silkscreen is correct. Trust me. Note that the 5532 -6dB gain stage, in the L and R domain, sits after the 1240 decoder between it and the 1646. 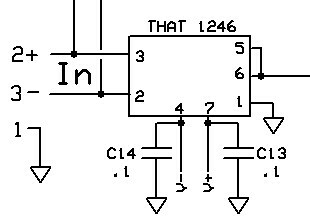 This is the schematic for the 1240 encoder and decoder IC3 and IC4, IC10 and IC11. The 1246 Input stages look like this. I stole this from the Pico Compressor drawings. Ignore the component designators. The 1646 OutSmarts(tm) stages look like this. Ignore the input coupling caps. They are not used and the component designators are bogus. If you're going to use the 1646 with single-ended loads make sure the other output is grounded or it will seem noisy. This is the 6dB pad in the decoder. One-half shown. That bit about the compensation capacitor being optional I wouldn't take too seriously. Use a 22pF with a 5532. 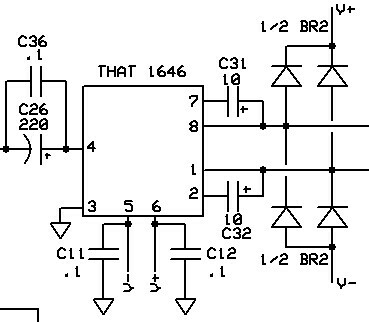 Want to use a different op amp? Be my guest. I'd keep it bipolar and low noise. This is not the place for a TL072. Last edited by mediatechnology on Fri Apr 08, 2016 2:16 pm, edited 15 times in total. Thanks. Can't wait to find the time to order and build! What is the orientation of the jumpers on the board? To disable the insert point is the jumper installed from one silkscreened box to the box below? EDIT: If I understand your question correctly, no. Take a look above. The bottom-most rows are Ground. The jumpers link vertically from insert send to insert return. To disable them just remove the jumper or store it on one pin. Look at BL and BR for example. That's point B on the block diagram for Left and Right. The top row of pads on BL are the Left Insert Send Out. Point B is Encode Left and Right Out Post-Line Receiver. Point C is Encode MS Out. Point G is Decode Left and Right Out Pre -6dB Active Attenuator and Line Driver. The "Precision" bypass mode jumps from C insert send to F insert return. Does the square pad indicate + for the electrolytic caps? Gold wrote: Does the square pad indicate + for the electrolytic caps? I got the encode stuffed and powered up over the weekend with no problems. I'll integrate it with the monitor controller soon. I don't think I'll get around to a full build for a while. The single encoder you built can also be a decoder if you re-label input left and right mid and side. The mid and side ouputs then become left and right out. So what you have right now can do both if you want to run decode experiments. This is the "half-duplex" build. I'm a bit of a simplex anyway.